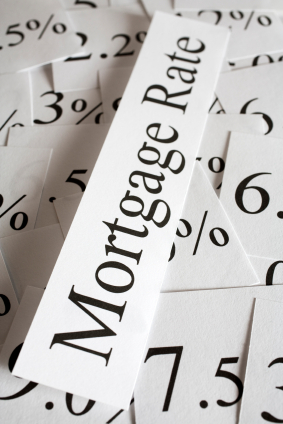 Dave The Mortgage Broker > Monday Morning Interest Rate Updates > Fixed vs. Variable: Is the Five-Year Fixed-Rate Mortgage Now a No Brainer? Fixed vs. Variable: Is the Five-Year Fixed-Rate Mortgage Now a No Brainer? Most market watchers now argue that fixed is the way to go in the current environment. That view is based in large part on the latest policy-rate statement from the Bank of Canada (BoC), wherein it assessed that “the policy interest rate will need to rise to a neutral stance to achieve the inflation target”. Variable mortgage rates are priced on the policy-rate, so if the Bank hikes by another 1% to 2%, our variable rates will increase by the same amount. Given that five-year variable rates are only about 0.5% lower than their fixed-rate equivalents in the current environment, it might seem like a no brainer to choose fixed. But at times like this, the contrarian in me remembers the famous quote from legendary investor Bob Farrell who said: “When all the experts and forecasts agree — something else is going to happen”. With that in mind, here is why the five-year variable rate may still be worth a look in the current environment. A barrel of Western Canadian Select oil now sells for (and this is not a misprint) $12 USD. That price is lower than it was during the oil-price crash of 2015 when the BoC responded with two emergency policy-rate cuts of 0.25%. Our average wage growth has decelerated for the past five months, and in October, our average year-over-year wage growth (1.8%) didn’t even keep pace with inflation (2.2%). While our unemployment rate of 5.8% stands at its lowest level in forty years, that is in part because our participation rate, which measures the percentage of working-age Canadians who are either working or actively looking for work, remains well below its long-term historical average. That means that our economy has more available labour capacity than our official unemployment headline otherwise implies. The BoC also keeps its eye on what is happening beyond our borders, and there we see ongoing trade uncertainty (U.S./China, Brexit), signs of slowing U.S. economic momentum as the effects from its tax-cut-induced sugar high fade, and instability risks from the Italian bond-market’s convulsions and from China’s sharp slowdown. That concerning backdrop offers a sobering counterpoint to the consensus belief that our mortgage rates are headed inexorably higher. All new variable-rate borrowers are qualified using the stress test. If you can pass that test, you can afford variable-rate increases that go beyond even the BoC’s most aggressive rate-hike timetable. Choosing a variable rate is a long-term strategy that comes with periods of short-term volatility. While existing variable-rate borrowers recently enjoyed the period from September 2010 to July 2017 where we didn’t see a single BoC rate hike, that was the exception, not the rule. While it may be hard to remember at the moment, variable rates go down as well as up. In fact, there hasn’t been a single five-year period over the last twenty-eight years (which is as far back as the BoC data go) where variable rates didn’t decline at some point. York Professor Dr. Moshe Milevsky wrote a famous study that compared five-year Canadian fixed vs. variable rates over the past twenty-five years and found that the variable rate proved cheaper 88% of the time. While it is true that we have been in a falling rate environment over most of that time (which naturally tilts the scales in favour of variable), Dr. Milevsky estimates that “the probability of winning with a variable will likely never fall below 70 per cent”. For a more detailed explanation, I recommend this Globe & Mail article, which was written by fellow mortgage broker Rob McLister. To be clear, I am not suggesting that the BoC won’t raise rates or that the variable rate is clearly the better bet. It’s just that in my nearly ten years of observing and writing about Canadian mortgage rates, I have found that more often than not, the consensus ends up on the wrong side of the fixed vs. variable question. So when most market watchers are suggesting a fixed rate is a no brainer, I simply must scratch my contrarian itch. If you are grappling with the fixed/variable question at the moment, here are three different variable-rate simulations showing how things might unfold over the next five years – one where the variable rate saves you money, one where fixed and variable rates break even, and another where the fixed rate wins out. You can then decide for yourself which rate path seems most likely for the years ahead. In each simulation, we’ll compare the total interest cost of the fixed and variable-rate options, with one additional wrinkle. I always advise my variable-rate borrowers to make their monthly mortgage payments equivalent to what they would have been if they had chosen a five-year fixed-rate mortgage instead. They can do this by simply asking their lender to automatically take an additional monthly payment that is equal to the initial difference between the two rates (which in this case works out to $136). Note that Canadian mortgages typically come with generous prepayment allowances, there is no cost/fee for making additional payments, and they can be cancelled at any time. Variable-rate borrowers who use their initial interest-rate saving to accelerate their mortgage repayment in this way can significantly reduce their total borrowing cost over time. To illustrate the impact that this make-hay-while-the-sun-shines approach can have, I will add a borrower who uses this trick to each simulation, and as in past posts on this topic, we will once again refer to that borrower as Mr. Samar T. Pants. In this simulation, the recent and ongoing weakness in our economic data pushes the BoC to the sidelines. The U.S./China trade war drags on and Chinese economic momentum continues to slow, causing commodity prices to soften further. The U.S. Federal Reserve’s aggressive monetary-policy tightening tips the U.S. economy into recession, and with the U.S. federal government’s budget deficit already at levels historically associated with severe recessions, the Fed is forced to reverse course and start lowering its policy rate. The BoC follows suit with two quarter-point rate cuts of its own, as Canadian economic momentum also slows. High debt levels and stagnant incomes exacerbate the impact of this lost economic momentum, and it takes until late 2021 before our economy recovers to a level where the BoC feels it can absorb additional policy-rate increases. In late 2021 the BoC begins to raise rates again, and we see a total of five quarter-point increases over the next twelve months before the Bank pauses to allow time for our economy to experience their full impact. In this simulation, the variable-rate saving is significant. Note: As variable rates rose and his regular payment increased, Mr. Samar T. Pants asked his lender to keep the amount of his payments constant, thereby reducing his extra payments by the amount of the increased interest rate cost. This meant that his total monthly payment of $2,432 didn’t rise until the final year of his term. While his initial extra monthly payment of $136 shrank as variable rates rose, Mr. Samar T. Pants’ mortgage balance is a full $9,383 lower at renewal time than it is for the variable-rate borrower who only made the minimum required payment (and that means that Samar will enjoy a lower interest cost over the remainder of his amortization period). In Simulation #2, the Canadian and U.S. economies ultimately prove resilient to higher rates. The BoC enacts its next quarter-point rate increase in January but then pauses to observe the collective impact of the five quarter-point increases that it made from July 2017 through to January 2019. Both the Chinese and U.S. economies slow in 2019. The Chinese slowdown pushes commodity prices lower, hurting the Canadian economy, and the U.S. slowdown also hits Canadian export sales. The rise in Canadian business investment that the BoC was hoping for doesn’t materialize, and when the Fed cuts its policy rate to try to stimulate U.S. economic growth, the BoC responds with two rate cuts in 2019. The BoC pauses for the remainder of 2019, but by early 2020 the Canadian and U.S. economies are rolling again. Oil prices recover and the price gap between a barrel of West Texas Intermediate and Western Canadian Select oil also narrows as pipeline bottlenecks are eased. The federal governments on both sides of the 49th parallel see infrastructure projects that were announced in the 2019 slowdown come online, and business spending and confidence increase. As our economy heats up, inflationary pressures rise, and in January 2021, the BoC begins to raise rates once again. We then see a total of seven quarter-point increases (one every three months) from January 2021 through to July 2022. In simulation #2, today’s five-year fixed and variable rates basically break even. Note: Even though the variable rate rose steadily during the middle of his term, Mr. Samar T. Pants still ended up with a balance that is $4,957 lower at renewal because he used his initial saving to accelerate his mortgage repayment at the outset. In Simulation #3, the BoC raises at its meetings in January and March of next year before pausing for the remainder of 2019. In early 2020 the Bank starts hiking again and returns its policy rate to a neutral level by that September. Meanwhile, the Fed continues to steadily hike rates. The U.S./China trade war de-escalates, and the USMCA is ratified without major revisions. The Chinese government launches an aggressive stimulus spending program that recovers its lost economic momentum. Demand for commodities rises, and prices recover to Canada’s benefit. The U.S. federal government launches an aggressive infrastructure spending program, which fuels a rise in GDP growth but also exacerbates labour shortages and accelerates average wage growth. A cap on student-debt interest rates helps first-time buyers enter the housing market, bolstering U.S. residential real-estate prices and underpinning a broad rise in consumer spending. U.S. inflationary pressures build, and the Fed continues to raise rates. Increased U.S. demand buoys Canadian export sales, and businesses invest in productivity enhancements and expansion. Demand for labour increases and average incomes rise, even as more Canadians re-enter the work force. The steady string of policy-rate rises finally catches up with both the U.S. and Canadian economies, and both enter a mild recession in 2021. The BoC responds with two rate cuts, and our economy recovers by early 2022. The Bank then resumes tightening its monetary policy and raises rates four times over that year before pausing to allow our economy to absorb those increases. 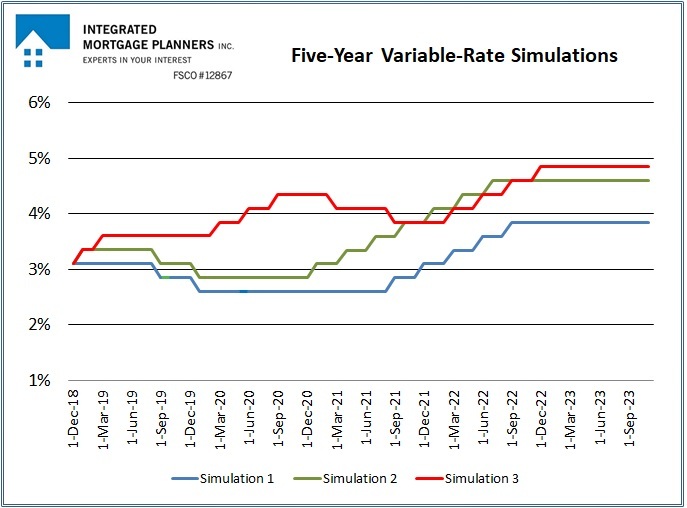 In this simulation, today’s five-year fixed rate proves the far cheaper option. While Mr. Samar T. Pants no doubt wishes that he had opted for a five-year fixed rate, by setting his initial variable-rate payment as if he had taken the fixed rate, he experienced less payment shock than a variable-rate borrower who just paid the minimum. Samar started his payment at $2,432, and it eventually peaked at $2,751, which was a total increase of $319/month. Meanwhile, the variable-rate borrower who always paid the minimum saw his initial payment rise by $455/month (and his balance was also about $500 higher at renewal). While there is no such thing as a one-size-fits-all solution for mortgage borrowers, the simulations above provide some examples of how the future may unfold. If you can handle the volatility of fluctuating payments and are willing to risk the possibility of higher mortgage payments in exchange for potential saving over the next five years, the variable rate is still a viable option, despite what most pundits now say. Conversely, if you value the stability of knowing that your payments are set for the next five years, especially given the likelihood of increased rate volatility (in both directions) over the next five years, the premium you pay to lock in today is relatively small by historical standards. The Bottom Line: What fun would a fixed/variable rate comparison be without a definitive call at the end? While my crystal ball is as murky as ever, the contrarian in me thinks that the BoC’s actions will not match its words over the near term. I just can’t see the Bank tightening aggressively when Canadian oil prices are so depressed and without evidence of more sustainable wage-growth momentum. Over the longer term, I think that technological advances will help keep a lid on inflationary pressures, and that aging demographics and today’s high government and consumer debt levels will limit future rate rises. That said, variable-rate borrowers should expect to have their courage tested in the coming years because for better or worse, we live in interesting times.